Uavos, a developer of unmanned systems solutions, has announced that it has updated its lineup of automatic control systems, and released a new modification to its MICRO autopilot (version AP10.3). The small-sized automatic control system is designed to be integrated into unmanned industrial grade professional aerial vehicles with a take-off weight of up to 22 lb (10kg). Flight tests showed the stability of the system under the conditions of jamming countermeasures targeting the satellite radio navigation signals (SRNS) and command radio link systems. The MICRO automatic control system is designed to be installed into the wing of an unmanned aerial system (UAS), with a depth of 0.51 inches (13mm), a length of 2.6 inches (66mm) and a width of 1.65 inches (42mm). 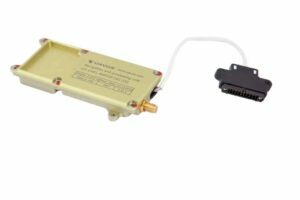 The SRNS module is made as a separate unit for convenient placement on board the UAS, and serves the further purpose of removing the magnetometer from the on-board radio electronic equipment influence area. The Autopilot MICRO is constructed as an industrial fully hermetic system with an extended temperature range from -40F (-40C) to + 122F (+50C). With a casing made of aluminum the weight of the autopilot with a modem and a pitot-static tube (PST) is only 0.180 lb (80grams). The new version of the autopilot has all the essential interfaces to connect sensors, transducers, and payload, as well as the ability to connect any type of servo drive via PWM, RS485, S-BUS, CAN interfaces. “This modification of the MICRO has allowed us to solve several problems at once: to remove the autopilot from the zone of the center wing – thus making room for the payload and batteries. The updated autopilot can be placed almost anywhere in the aircraft. We also managed to remove the magnetometer from the zone of electromagnetic interference, and to get rid of the high-frequency cable. These solutions allow the use of the internal UAV volumes more effectively, improve the electromagnetic compatibility of on-board equipment, and enhance the reliability of the unmanned aerial complex in general,” said Vadim Tarasov, Uavos investor and Board member.